Posted in: Development Tools, Support Questions. Note that I tried the command before deleting the .brz folder. Once I deleted it, it worked fine. The fix is known and will be available in the next release. I’ve downloaded Bzr 2,2,1-3 for Windows. The system is Vista 32bit. Sure would like to get going. Update: Looks like it may have worked inspite of the error. I was able to open the repository. But I can’t find anyway to add files from the file system to the trunk. What’s the next step? 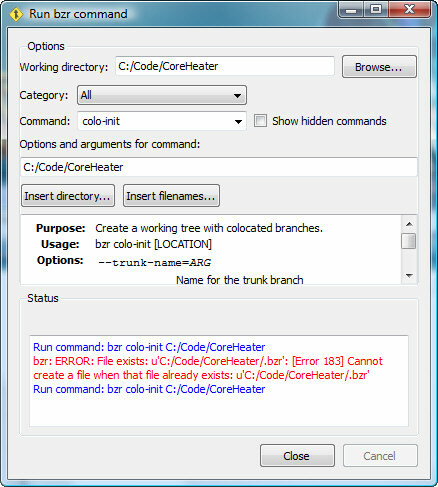 Create a branch? That’s not what the “Starting a Project” page says. It says add files to the trunk. How can I do this, or is this repository not created correctly?